Microsoft has created some customized Windows VHDs with the purpose of allowing web designers to test websites in Internet Explorer 9, 8 and 7, for free. To make it easier to set up, xdissent has created a Mac OSX / Linux script that will download the required files, extract them, install the latest VirtualBox guest additions and so on. sometimes a website behaves differently in IE9's IE7 or IE8 compatibility mode compared to the actual Internet Explorer 7 or 8.
the biggest disadvantage is the disk space required by these VHDs (as well as a large download size: 2,6 GB for IE7 and 4,1 GB for IE8 and IE9). If you want to run all 3 Internet Explorer versions supported (7, 8, 9), you'll need almost 45 GB of disk space. But you can install just one version: for Internet Explorer 7 you'll need 13 GB, for IE8: 8,4 GB and for IE9: 13 GB. Note: the machines will prompt you to activate Windows. This is not required and you can cancel this request. You can extend the trial for another 30 days by running the following command at the command prompt: "slmgr --rearm" or you can simply reset the machine to its original state. If you want to check out the script source before running it, you can find it @ GitHub. Where "9" is the IE version you want (you can also add two versions here, like "7 9"). At this point, the download should start and it will take a while so be patient. 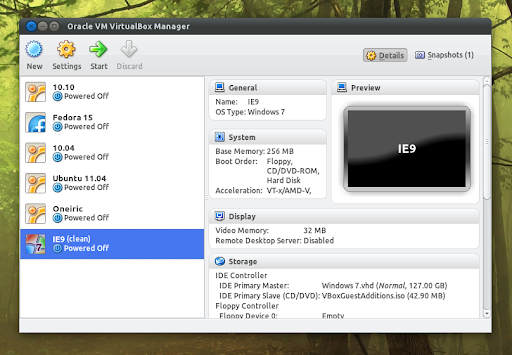 After the download finishes and the archives are extracted, a new machine should show up in VirtualBox, called "IE 7", "IE 8" and/or "IE 9", depending on which versions you've selected to install. At this point, you can delete the downloaded archives if you want to free up some space - you can find them under ~/.ievms/vhd/ (make sure you only delete the .exe and .rar files and keep the .vhd and .vmc files). Now you can start testing your website in IE9, IE8 and IE7 under Linux or Mac OSX. Oh, and the password for all the VMs is "Password1".